If you think being a goal keeper is easy, say that to six foot three, All White Goal Keeper, James Bannatyne. Bannatyne is conducting an intensive four-day Goal Keeping Coaching Course with the Football Federation Samoa (F.F.S). 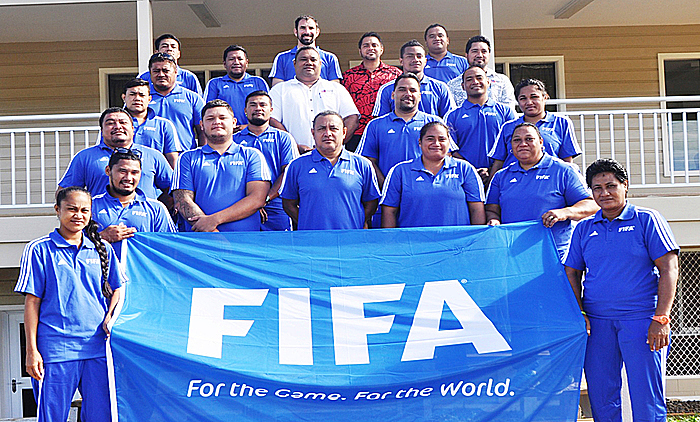 Twenty five goalkeepers and coaches from throughout Samoa and American Samoa are participating in the course to improve their performance, technique, and plan and prepare technical practices. Bannatyne is no stranger to Samoa, having hosted courses like this one here before. He is excited to see many familiar faces that have attended his workshops before and also the progress that they have made. The intensive four-day training consists of field work, course work, and watching videos to truly comprehend the level of skill that is needed to develop great goal keepers. Not only is Bannatyne training goal-keepers in Samoa, he is also working with Samoa’s U17’s Goal keeper, Pele Tamaolefale, who is now based in Auckland at the Oceania Football Education Centre. “Pele who is the goal keeper for Samoa U17’s, is part of the Oceania Football Education Centre in Auckland. I’ve had the pleasure of working with Pele and I have a video to show the participants this morning as well,” he said.